Breadwinner Cycles Fabrication Shop Tour + brewery stop! We’d like you to meet our impressive filmmakers who hail from all over the world! And what better way than to ride bikes together? Enjoy a beer and relax before the ride. CHECK IN: 11:30 a.m. // START: 12:00 p.m.
Portland is home to some 80 craft breweries but today, unfortunately, we only have time for two. We’ll be stopping at Culmination and Migration for a pint of beer and plenty of good cheer as you get an opportunity to hang out with our visiting and local filmmakers. Breadwinner Cycles makes handmade, custom bicycles for people who love to ride every day. Each bike they build is one-of-a-kind, a unique expression of craftsmanship, quality, beauty and the joy and freedom of the ride. American manufacturing is alive and thriving in Portland. Breadwinner Cycles’ dedication to impeccable quality makes them one of the leaders in the bike industry. 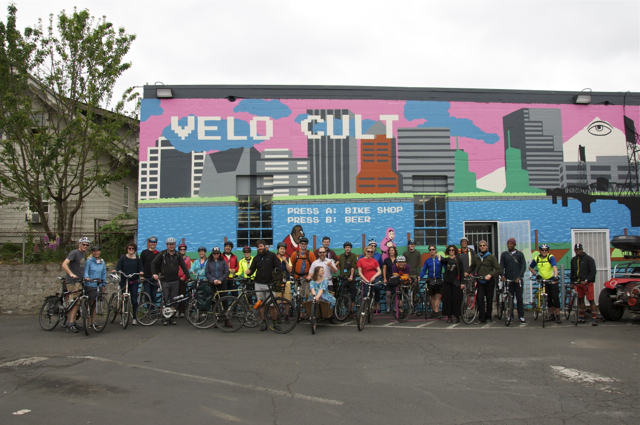 If you’re headed to the final two festival showtimes, join the Group Ride to the Hollywood Theatre or back to Velo Cult. END TIME: Approximately 5:00 p.m.
Chat with the filmmakers as you ride and sip. Ask them about biking in their home country or city. Get to know their tricks and tips for making bike-themed movies. Learn about their culture. Leading the tour will be Guthrie Straw, Filmed by Bike Films Manager. He’ll talk about how we find the films we show and what trends he’s seeing in the world do bike movie making. This is a slow-paced ride with leaders at the front and back. We will split into three groups, including one group for people who want to have lunch during the ride. Space is extremely limited, so reserve your spot today. Tickets are $20. Registration is complimentary for Festival Pass holders but you need to reserve a spot to have a spot. This ride takes place on city streets open to vehicle traffic. While we have chosen a calm route, there will be times when we are on busier streets. You must be comfortable riding in a group with traffic passing by. Follow the rules of the road and ride respectfully – this is an opportunity for us to showcase how respectful cyclists can be. Join us as we set the tone for safer streets in Portland. Oregon beer is strong. Please drink and bike responsibly. For the best experience, we recommend sharing a tasting (series of small pours) with a friend. We are not responsible for lost or stolen items, or injured riders. Participate at your own risk. All of your friends! This ride is much more fun with buddies along for the afternoon. Your sense of adventure! Meet other riders and chat with the filmmakers. Cash for efficient transactions at the crowded brewery stops. Lights because you never know where all this fun might take you.